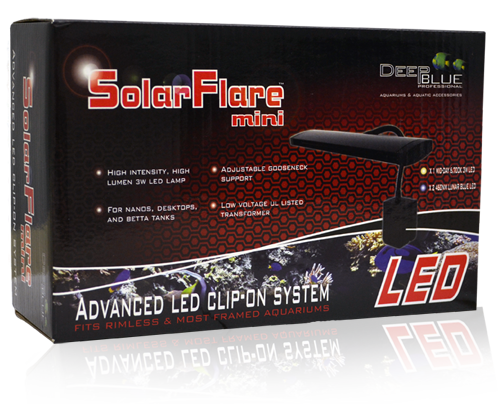 Deep Blue Professional SolarFlare Mini Gooseneck LED Light The SolarFlare Mini Gooseneck LED Light unit clips on to the top edge of almost any small Desktop aquarium, including all Deep Blue Betta tanks and our Rimless Cubes. 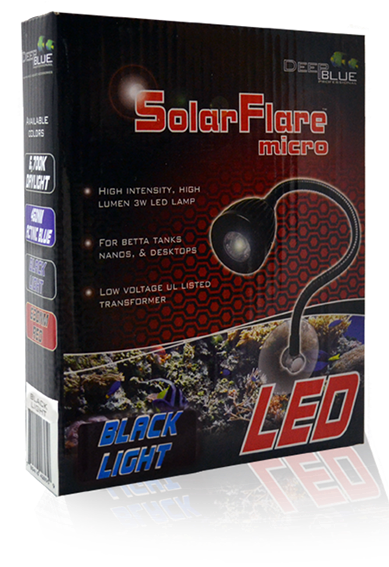 With 1 6700k 3w white LEDs and 2 blue LEDs at .25w each, it provides all the light you need for your desktop aquarium. Size: Mini-1x3W; (1) 6,700K Mid-day lamps, (2) .25W Actinic Blue LEDs. Size: 115-5x3W; (2) 10,000K Daylight Lamps, (2) 6,700K Mid-day lamps, (1) 460NM Blue Lamp. Deep Blue Professional SolarFlare DX Double LED Strip Light 24 The SolarFlare DX Double LED Strip has a double row of 3 watt 10,000K (white) and 460nm Actinic (blue) LEDs with deep-focus polycarbonate lenses that project intense beams of brilliant light to depths of more than 30.  The streamlined, fan-cooled case moves excess heat away from the aquarium, while the 3-position rocker-style power switch lets you choose between off, blue-only or blue-and-white illumination with single-cord convenience. The strip can be mounted on the aquarium using the built-in legs, or hung above the tank using the wire hanging kit (included) 72 watts total output. Deep Blue Professional SolarFlare DX Double LED Strip Light 48 The SolarFlare DX Double LED Strip has a double row of 3 watt 10,000K (white) and 460nm Actinic (blue) LEDs with deep-focus polycarbonate lenses that project intense beams of brilliant light to depths of more than 30. The streamlined, fan-cooled case moves excess heat away from the aquarium, while the 3-position rocker-style power switch lets you choose between off, blue-only or blue-and-white illumination with single-cord convenience. The strip can be mounted on the aquarium using the built-in legs, or hung above the tank using the wire hanging kit (included) 144 watts total output. 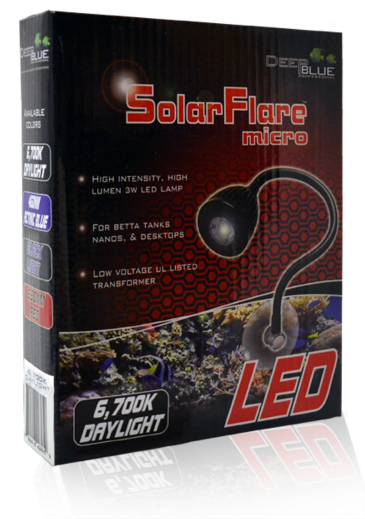 Deep Blue Professional SolarFlare Micro Suction-mount Gooseneck LED 6700K Daylight 3 Watt High-intensity single-head LED lamp with Gooseneck design and heavy-duty suction cup mount Great for most flat-sided desktop aquaria and fsh bowls. Also makes an excellent source of accent lighting for larger aquariums and terrariums. 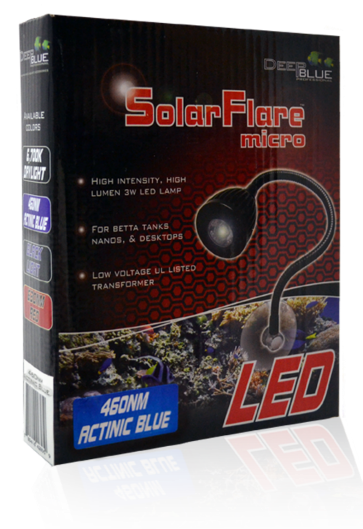 Deep Blue Professional SolarFlare Micro Suction-mount Gooseneck LED 460nm Actinic Blue 3 Watt High-intensity single-head LED lamp with Gooseneck design and heavy-duty suction cup mount Great for most flat-sided desktop aquaria and fsh bowls. Also makes an excellent source of accent lighting for larger aquariums and terrariums. Size: 3 Watt diode 460nm Actinic Blue LED. 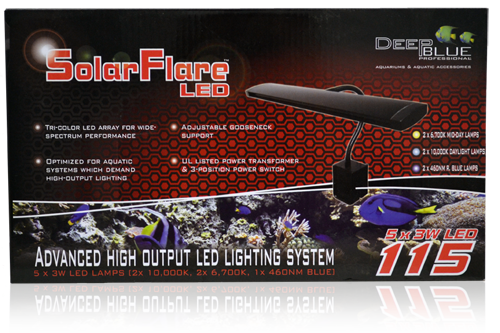 Deep Blue Professional SolarFlare Micro Suction-mount Gooseneck LED Black Light 3 Watt High-intensity single-head LED lamp with Gooseneck design and heavy-duty suction cup mount Great for most flat-sided desktop aquaria and fsh bowls. Also makes an excellent source of accent lighting for larger aquariums and terrariums. Size: 3 Watt diode Blacklight UV LED. 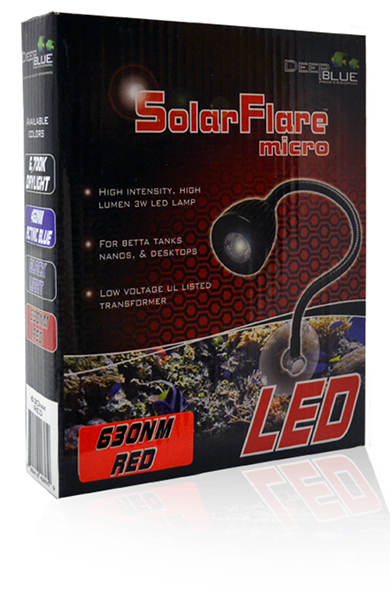 Deep Blue Professional SolarFlare Micro Suction-mount Gooseneck LED 630nm Red 3 Watt High-intensity single-head LED lamp with Gooseneck design and heavy-duty suction cup mount Great for most flat-sided desktop aquaria and fsh bowls. Also makes an excellent source of accent lighting for larger aquariums and terrariums. SolarFlare Eco LED Strip 20 9.5w The wow factor of LED in an economy strip light. It features a 3-position switch to activate the blue and daylight LEDs combined or just the blue moonlights. Can also be used as an upgrade/replacement strip for our Deluxe Flourescent full hoods. SolarFlare Eco LED Strip 24 12.5w The wow factor of LED in an economy strip light. It features a 3-position switch to activate the blue and daylight LEDs combined or just the blue moonlights. Can also be used as an upgrade/replacement strip for our Deluxe Flourescent full hoods.